Are you trying to find out exactly what the Shakeology ingredients are? If so, you are in the right place. 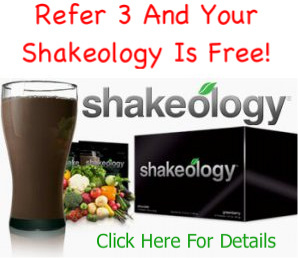 In this post I’m going to give you the break down on the Shakeology ingredients for each of the three flavors. Shakeology contains over 70 high quality, super food ingredients that have been proven to do wonders for your body and overall health. Shakeology is high in protein, but it is much more than just a “protein shake”. Chocolate contains 18 grams of protein, Tropical and Greenberry both contains 15 grams protein. The protein and amino acids found in the Shakeology ingredients are beneficial in many ways. It helps repair and build muscles, reduces hunger and cravings, keeps blood sugar levels steady, supports brain functions to help promote alert thinking and reduce anxiety, and also produces healthy skin, hair, and nails. Shakeology ingredients include prebiotics and digestive enzymes that are great for the digestive system. Prebiotics are natural components of certain plants, they help support the “good” bacteria in the body’s digestive system. Digestive enzymes, which come from plant sources such as pineapples and papayas, help the body break food down which makes the nutrients easier to absorb. 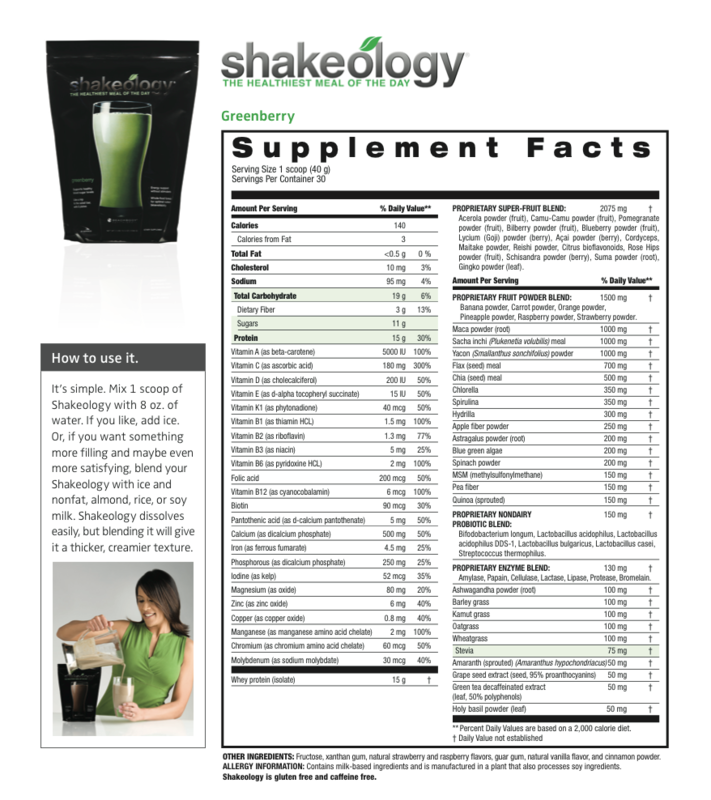 Shakeology ingredients also contain antioxidants and phytonutrients. These substances have antioxidant properties, meaning they help get rid of molecules known as free radicals, which damage cells and said to be a key component of the aging process. 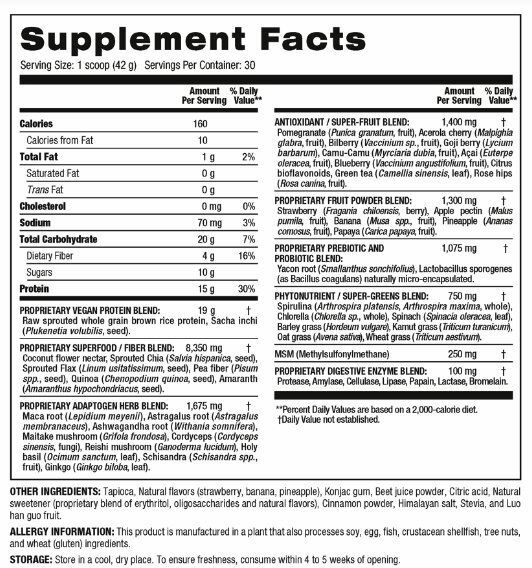 In laboratory tests, phytonutrients have shown promise in helping prevent a wide variety of degenerative conditions. What’s more, studies suggest that the natural mix of phytochemicals you get from whole-plant sources, which is how they are used in Shakeology, is more effective than taking them individually as nutritional supplements. 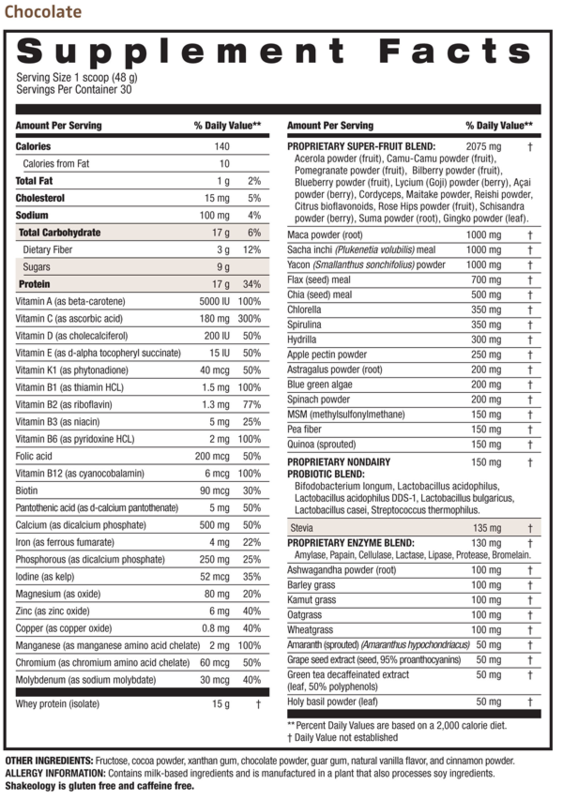 Shakeology also contain 23 vitamins and minerals. 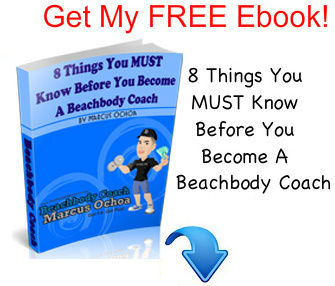 Most people do not get the essential vitamins and minerals needed from their daily diets. Some important vitamins, such as vitamin C and the B vitamins, are water-soluble, meaning they’re flushed out of your body after a short time and need to be replenished often. Others, like vitamin E, can be hard to get enough of in food alone. Shakeology provides all of these nutrients in an easy-to-take, easily absorbable form, so you never have to worry if you are getting the vitamins you need. 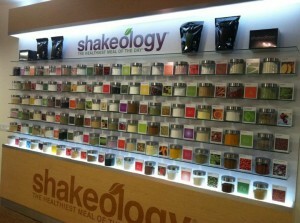 If you are drinking Shakeology on a daily basis, you know you be getting the nutrition that you need. In the video below, the creator of Shakeology, Darin Olien shows how he travels thew world in search of the super food Shakeology ingredients. Ingredients like sacha inchi, maca root, and cacao.